The Chicago Cutlery Walnut Tradition 3-Inch Slant Tip Paring Knife features classic styling that you will love. High-carbon stainless steel blades resist rust, stains, and pitting, while Chicago Cutlery's exclusive 25-degree Taper Grind edge provides optimum sharpness. Featuring triple brass rivets and a full metal tang, this knife gives you stability and control for sure, safe handling during meal prep. The attractive, contoured walnut handle with brass rivets is comfortable in the hand and adds a classic look to your kitchen decor. Chicago Cutlery's Walnut Tradition 3-inch Slant Tip Paring Knife comes with a full lifetime warranty. Hand washing is recommended. 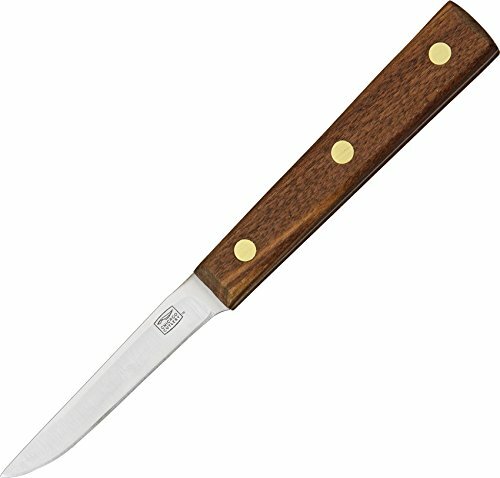 Chicago Cutlery Walnut Tradition 3-Inch Slant Tip Paring Knife features classic styling that you will love. High-carbon stainless steel blades resist rust, stains, and pitting, while Chicago Cutlery's exclusive 25-degree Taper Grind edge provides optimum sharpness. Featuring triple brass rivets and a full metal tang, this knife gives you stability and control for sure, safe handling during meal preparation. The attractive, contoured walnut handle with brass rivets is comfortable in the hand and adds a classic look to your kitchen decor. Chicago Cutlery's Walnut Tradition 3-inch Slant Tip Paring Knife comes with a full lifetime warranty. Hand washing is recommended.